As a child bike accident attorney in Los Angeles, CA, I realize that children are in one of the most vulnerable classes of people likely to be injured or killed in a bicycle-related motor vehicle collision. For example, in 2013, the National Highway Traffic Safety Administration reported that 743 bicyclists were killed and an estimated 48,000 were injured in motor vehicle collisions in 2013. Among those who are killed, the age groups with the highest risks are adolescents between the ages of 15 and 19, young adults up to age 24 and people older than age 45. The NHTSA also reports that children between the ages of 5 and 15 account for more than 20 percent of bicycle fatalities, and a majority occur when the bicycles are hit by cars. In Los Angeles in 2013, a total of 2,340 bicyclists were killed or injured. Of that number, 168 were children who were under the age of 15. Riding bicycles can be a safe and fun way for children to exercise and to enjoy the environment. Parents can take steps to help to keep their children safe when they are riding bicycles so that they are less likely to be struck by cars or to be injured if they have accidents. One of the most important things that parents can do is to make certain that their children always wear bicycle helmets. According to Safekids.org, bicycle helmets that are properly fitted reduce the risk of suffering a head injury by 45 percent. In spite of this, less than 50 percent of children who are under the age of 14 regularly wear helmets when they ride bicycles. Parents should talk to their children about the importance of always wearing helmets and other safety gear when they ride their bicycles. They should establish rules requiring helmet use at all times and enforce the rule if their children break it. Parents should teach children to always ride their bicycles on the sidewalks if it is possible. They should be taught to watch for vehicles that might be backing out of driveways or pulling into them. Children should learn all of the proper hand signals to use when they are turning so that cars are able to understand their movements. It is important for children to be clearly visible on their bicycles. Parents should make them wear bright clothing and use reflective tape to make them stand out to motorists. It is important for children to learn the rules of the road and to follow them at all times. The parents should take the time to teach them what different signs and signals mean and how to cross the street safely on their bicycles. If children are unable to stay on the sidewalk, the parents should teach them to ride as far to the right as possible while traveling in the same direction as the other traffic. One of the best ways to help to keep children safe while they are riding bicycles is for the adults to ride with them. Riding together as a family can help motorists to see everyone while also allowing the family to enjoy exercising together. Parents should continue taking bicycle outings with their children until the kids are comfortable with riding and the parents are assured that their children understand all of the important road rules. Parents might also want to limit their children’s riding to bicycle paths in parks so that they might avoid traffic altogether. While it is not possible to avoid every bicycle accident, the risk may be minimized by following these safety tips. By teaching children the importance of safety, parents may help to keep their children safe. If children are injured in a bicycle accident with a motorist, contact an experienced Los Angeles personal injury attorney for help. Children do not have the same ability to perceive objects near to them as do adults. For children who are ages 5 to 9, they may identify objects, such as motor vehicles, in their peripheral vision. While adults can teach children to use their peripheral vision and the basic rules of the road for riding a bicycle, younger children are much slower at correctly identifying objects using it than are older people. Similarly, children do not tend to use sound when they are identifying cars around them, instead relying on their vision. They are still in the process of developing their senses of danger, and they have the mistaken notion that if they are able to see themselves that others will as well. They may also become impatient, running through lights instead of waiting because of a lack of impulse control. Under California Vehicle Code 21200, bicyclists share the same duties and rights as do other people who are traveling on the roads. This includes the responsibility for following applicable traffic laws. Children in the state are treated differently than are adults, however. In a bicycle accident, the standard of care that is expected of a child is the standard that would be reasonable for other children that are of the same age and intelligence and having similar amounts of experience and knowledge. When a child is seriously injured in a bicycle collision, it may be best to get help from a child bicycle accident attorney. There are special considerations that must be taken into account in cases in which the victims are minors. In order to protect minors, the law has special procedures that must be followed. When a lawsuit is filed on behalf of a minor, the court will appoint a guardian ad litem to represent the child’s interests. When a settlement is negotiated, the court will review it with the guardian ad litem to make certain that it is reasonable. The funds must then be held for the minor’s benefit until he or she reaches age 18. Often, this is done by setting up a trust account to hold the funds. While a parent may serve as his or her child’s guardian ad litem, a conflict of interest may exist if the parent is also a party to the same lawsuit. In that case, another family member can seek appointment as the guardian ad litem. The court must approve any settlement agreement that is reached even if it is reached before a lawsuit is filed. When there is a compromise offer, a petition must be filed with the court for its review. These petitions must outline specific facts, including the date and time of the accident, all parties who were involved, all settlements that were paid to other persons who were also injured in the accident, the extent of the injuries, the nature of the injuries and the prognosis for recovery and all of the terms of the settlement offer, among others. When minors are injured in bicycle accidents, an attorney may be best suited to determine liability under the standard of care outlined for children. He or she may also be able to secure settlements or judgments in amounts that are sufficient to compensate the children fairly. He or she may also help to ensure that the minor’s interests will be protected and the monetary award will be held for him or her. 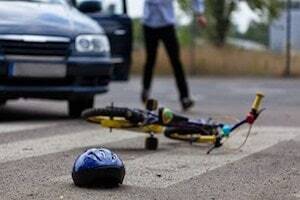 Contact a child bicycle accident lawyer in Los Angeles to learn more about your child’s case and rights.